Nope. It has not crashed. That is the RHINSPEED SQUBA. 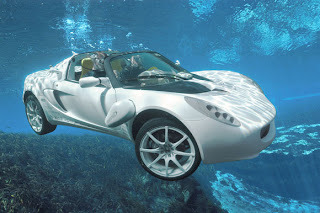 It is the world’s first car that can be driven both on land and under water. 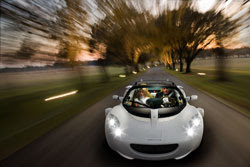 The ‘sQuba’ is a zero-emission car as documented by the rotating license plate in the rear. 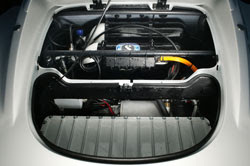 Power is supplied by rechargeable Lithium-Ion batteries. Three electric motor are located at the rear of the sQuba. One provides propulsion on land, while two drive the the screws for underwater vroooming. An open top means the car’s mobility isn’t hampered by trapped air and stops you from getting stuck, which of course could cause death. 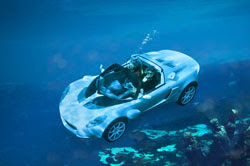 It has a scuba-tank of compressed air, which means you don’t have to hold your breath while motoring. Without occupants, the sQuba will surface automatically. The twin water jets mounted on rotating louvers at the front of the vehicle provide steering and lift while it is underwater and the propellers at the rear provide forward movement. 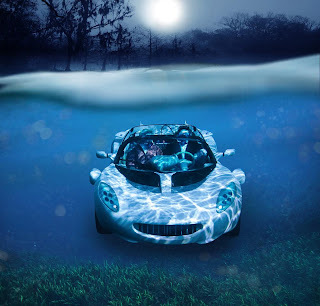 If you drive into the sea or river, it changes the power from the rear wheels to pump. 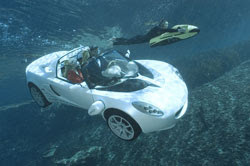 The vehicle’s interior is water and salt resistant so that it can be driven in the ocean. The alloy wheels are lightweight and resistant to sea water, thanks to special paint from German alloy wheel manufacturer AEZ. With it’s shimmering silver nad bright yellow contrasts interior will make squid wave at you, and whales want to hump you. 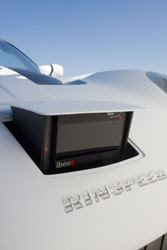 The sQuba has wheels to take to the road at speeds of up to about 100kph, and can even drive itself thanks to a laser sensor. The sQuba is purely a concept at the moment, but it could go into production if we wish hard enough.